Rock from the Clogau gold mine containing traces of Welsh gold. Welsh gold is highly prized because of its origin and scarcity, and occurs naturally in two distinct areas of Wales. One area is in North Wales in a band stretching from Barmouth past Dolgellau and up towards Snowdonia. This was mined at several mines, the largest of which were the Gwynfynydd Gold Mine near Ganllwyd and the Clogau Gold Mine near Bontddu. In South Wales it is found in a small area in the valley of the River Cothi at Dolaucothi where it is known to have been mined by the Romans. Jewellery such as torcs were worn by early Welsh princes. 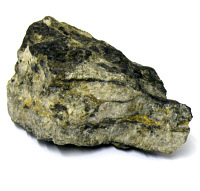 Welsh gold forms in veins or lodes of ore that yield up to 30 troy ounces per long ton (920 g/Mg). In comparison, South African gold ore yields just a quarter of a troy ounce for every tonne mined (8 g/Mg). However the South African gold fields are vastly more extensive. Gold was originally mined in Wales dating back 75 AD under a strict military operation by Roman Wales. The methods used were hushing and fire setting. Hushing consisted of creating a flood to remove soil revealing veins of gold hidden beneath. They would build large tanks containing water above the suspected gold rich area and released it suddenly forcing loose rock exposing the bedrock and potential gold held within. Fire setting was a technique that worked alongside hushing. Next to the suspected gold rich rock a fire would be situated. This would make removal simpler as the heat passes through the rock creating disruption. Once inspected and the process undergone several times hushing would work alongside, quicker removing the loose rock allowing work to continue. The process was soon become redundant with the introduction of explosives. Gold mining today normally falls under the miners term of sub-surface mining. This is one if not the most dangerous forms of mining as there are several variables held such as: gas leaks, falling rock and heat stroke. Although procedures enforced lowering the risks are stringent, there is always a risk working in such conditions and now coinciding with heavy machinery. Machinery is used for the removal of gold know as hard rock mining. This technique is the main process used for the removal of gold the world over, although there are other techniques used such as the cyanide process that consists of mixing sodium chloride with fine rock where gold or silver is found. This process shall remove the gold from the rock. Each piece of Clogau jewellery is made to a very high standard and mainly crafted from two colours of gold. Most often the rose gold contains Welsh gold and each piece is stamped with the Clogau and Welsh Dragon marks. In 1989, the Clogau St. David’s gold mine was discovered by William Roberts. William wanted to re-open the mine as a tourist attraction, an idea that was overturned by the Snowdonia National Park. As a result, William decided to gamble on the idea that there would be more gold within the mine. Luckily, there was, and a few years worth of small scale mining began in 1992 where precious rose-coloured gold began to be extracted. To make the best use of this magnificent gold, William decided to use it to the produce jewellery of the utmost beauty and quality, using the natural beauty and history of Wales as his design inspirations. 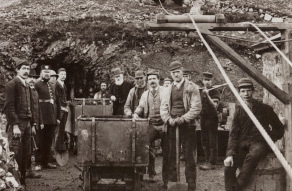 The miners who worked the mine were the direct descendants of the original workers who once struck gold at the Clogau Mine in 1854. To begin with just 5 lines of jewellery were created. And so in 1992 Clogau Gold was born. The precious yellow metal extracted from the Clogau St. David’s Gold Mine was one of the rarest golds in the world. It is included within every piece of Clogau jewellery. Environmentally mined, Clogau separated out the gold using water from the adjacent crystalline streams. 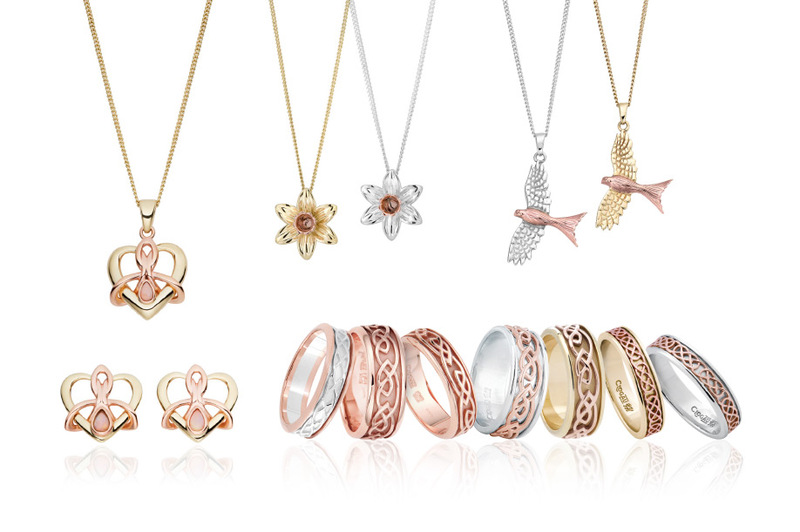 Today Clogau Gold is more beautiful than ever. William and Margaret spent many hours carefully designing these beautiful and collectable pieces along with their full time designers and craftsmen. With no gold mining taking place in Wales today, Welsh gold supplies will eventually run out, making it possibly the rarest gold in the world. Due to the scarcity of Welsh gold, only a touch is included within each piece of Clogau. This ensures the longevity of Welsh gold supplies, and the affordability of Clogau’s jewellery.